This gold Claddagh wedding ring for women features sapphires and CZ stones in the band. 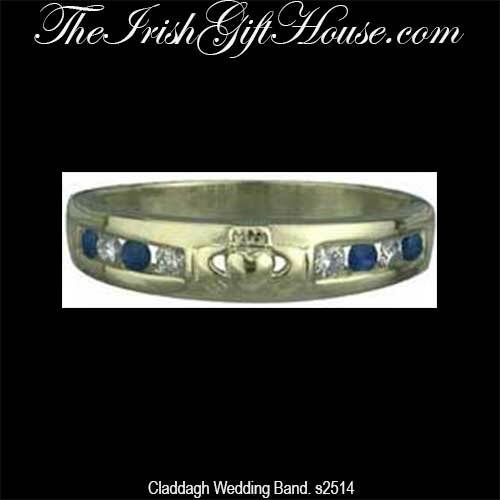 This 14K gold Claddagh wedding ring features both sapphires and CZ stones. The 1/4" wide Claddagh wedding band features eight channel set stones, four sapphires (0.14ct) and four CZ stones; two of each stone are present on each side of the Irish symbol. The women's Claddagh wedding ring is made by Solvar Jewelry in Dublin, Ireland and it is gift boxed with a Galway Folklore card that explains how to correctly wear the Irish ring along with a Claddagh history card that is complements of The Irish Gift House.